Casey Stoner couldn’t buy a win for nearly a year in MotoGP, but a stunning ride to victory in today’s Japanese Grand Prix gave him a second success in two weeks. Stoner had ended his winless streak with a dominant display in the inaugural Motorland Aragon race in Spain last month. And he was untouchable again at the Twin Ring Motegi this afternoon, the 24-year-old leading from the first corner to take a fourth win for Ducati in Honda and Yamaha’s backyard. Andrea Dovizioso, who had claimed his career first MotoGP pole position yesterday, looked like claiming the holeshot before Stoner steered his factory Ducati GP10 into the lead on the brakes at turn one. The 24-lap race quickly developed into a two-horse race between Stoner and Repsol Honda rider Dovizioso at the front with Fiat Yamaha duo Valentino Rossi and Jorge Lorenzo locked in their own enthralling scrap for third. 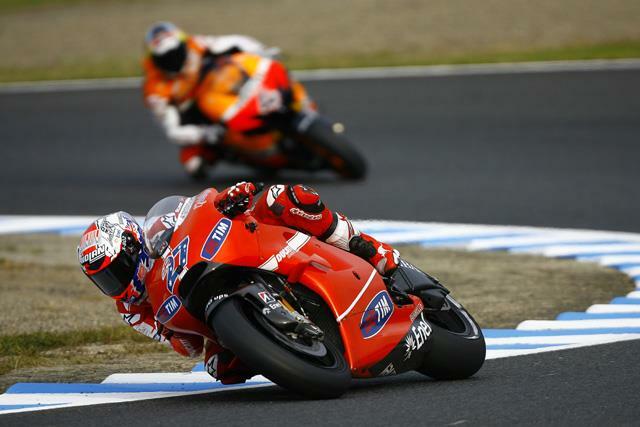 Stoner quickly established a comfortable lead of 0.666s by lap five as Dovizioso initially struggled to match the 2007 world champion’s early pace. But four laps later and he seemed to be mounting an attack on the Aussie, who will join Honda in 2011. The Italian closed the gap to 0.446s on lap nine but ten laps later and his brave resistance was finally broken. Stoner had clearly got plenty in reserve and on lap 19 he pulled 1.377s clear and his winning margin at the end was a massive 3.868s. With Stoner claiming his second successive win in relatively comfortable fashion, over five seconds further back came an epic tussle between Rossi and Lorenzo, reminiscent of their pulsating battles in 2009. Rossi had took third from the Spaniard on lap six and threatened to move clear as he quickly opened up a 0.451s lead on his team-mate. Lorenzo refused to be shaken off though and on lap 18 he claimed third back, only for 31-year-old Rossi to retaliate instantly. It was on the penultimate lap that the action really intensified with Rossi and Lorenzo touching as they exchanged several overtakes. Lorenzo attacked on the final lap, but as in Catalunya last season, he was to be defeated again with Rossi producing another brilliant counter attack to seize third. It was the Italian’s third podium finish since he returned from a broken right leg in mid-July and consigned Lorenzo to a second successive fourth place. With compatriot Dani Pedrosa though unlikely to be fit in time for next weekend’s Sepang race, the 23-year-old is expected to wrap up the title in Malaysia. Pedrosa broke his left collarbone in a practice crash in Japan, leaving Lorenzo requiring only six-points in Sepang to be crowned world champion. Monster Yamaha Tech 3 rider Colin Edwards easily produced his best ride of the season, the veteran American claiming fifth after an exciting dice with Italian Marco Simoncelli. Alvaro Bautista was an impressive seventh on the factory Suzuki with Ben Spies claiming a heroic eighth place. The Texan’s hopes of finishing top non-factory rider for the sixth successive race were effectively ended on the second lap after an incident with compatriot Nicky Hayden. Spies and Hayden both nearly ran into the back of Loris Capirossi at turn five and had to take evasive action that put them both in the gravel. He dropped back to 15th but then produced a masterclass in overtaking to fight his way back into the top ten.